Pier 39, San Francisco is the familiar tourist destination comprises shopping centre, restaurants, entertainment complex, amazing views of the water that surrounds the city. There was an idea about the construction of Pier 39 in August 1977. Construction was completed in the year 1978. On 4th October, 1978, Pier 39 was officially inaugurated. At the time of its opening, it encompassed 23 restaurants, 50 stores, street performers along with a diving pool. Eagle Café and Swiss Louis Italian & Seafood Restaurant and Pier Market Seafood Restaurant are still open today. Pier 39 started to add new attractions gradually. The Blue & Gold Fleet started to host Bay Cruises in the year of 1979. After four years a Venetian Carousel occupied that place by replacing the diving pool. The present two-story handmade Italian carousel replaced Venetian Carousel in 2008. The Aquarium Underwater World was inaugurated in 1996 which became the Aquarium of the Bay after a few years. In 2009, Magowan’s Infinite Mirror Maze was opened followed by the Musical Stairs in 2013 and 7D experience in 2014. Many restaurants occupied here over the years. In the past years, Pier 39 received a good recognition for its popularity. “USA Today” awarded the place as the third most visited attraction in the year 1989. 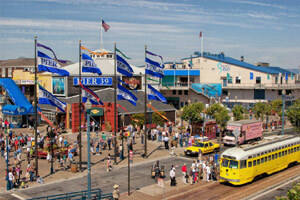 “The San Francisco Travel Association” rewarded the Pier 39 as the most visited attraction in the city in 2011. 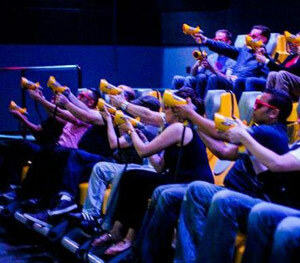 Thrilling roller coaster, interactive shooting gallery, a 20 seat digital theater, 3D effects and the latest laser technology are the special features of 7D experience. 20,000 local sea species is the highlight here. A Seven gill shark, moon jellies and a bat ray’s wing are outstanding. Crystal clear tunnels are being the dwelling of amazing animals. Animal feeding, presentation by naturalists are remarkable activities. It is open 364 days in a year. The double-decker carousel is Italy’s special import. The scenes of San Francisco beautify the carousel. Riding on the painted creatures such as water dragons, sea lions and Mer-horses gives an excited feeling. It features 1800 shimmering LED lights with over 30 animals to ride. During the ride, the riders hear conventional organ music. The aquarium of the bay operates the Pier 39 Sea Lions Centre. It does not charge any admission fee to have interactive displays, academic videos and opportunities to speak with the Aquarium naturalist. A K-Dock overlook makes a close-up view of the appealing mammals. One can find many jugglers, magicians, comedians in Pier 39’s carousel stage. They dedicate funny and crazy shows to impress the visitors. The tourists can watch the daily street performers’ shows from 12 PM to 8.50 PM. The street performers in the Pier 39 are really multi-talented. The Fog harbor is popular for its seafood and offers a good view of Pier 39, west side. The tourists can see the strolling of Blue and Gold Ferry and Rocket Boat. Alcatraz is viewable at a distance from fog harbor. It is being a favorite spot for lunch. PIER 39 is popular for offering fresh and delicious seafood dishes. It encompasses 13 restaurants where tourists can taste lip-smacking items such as sushi, salads, clam chowder, shrimp, Italian, pizza and burgers. One might have unforgettable experience with the exotic views of the San Francisco Bay, Golden Gate Bridge and Alcatraz by sipping a mixed cocktail. 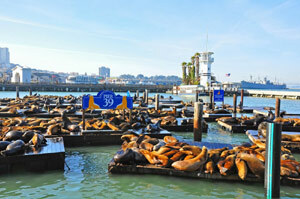 Keep Pier 39, San Francisco as one of your destinations to tour.